By making the exterior of his car serve as his album, E. Had-ley, of Casper, Wyo., has assembled one of the world’s strangest postage-stamp exhibits. Five girls worked for six weeks to plaster the machine with the 10,000-odd specimens, which are covered with a protective coat of varnish to shield them from the weather and hardships of the road. So far I have collected about 14,000 (of the estimated 30,000 I’ll need) computer keyboard letters for an Art Car. The reason I need so many is that I will make the letters spell out phrases and such. Most will be quotations about technology and the numbers will be used to spell out Pi on the trunk to as many places as will fit. This guy was known as Ed “600” Hadley and he did things like this to advertise his store “The Palms Ice Cream and Floral Company”. He was considered a local character in Casper. I wonder what happened to the car as well as the store. Wait a second…five girls worked for six weeks? Sticking one stamp at a time to a car? How many weeks did Mr. Hadley work? Why aren’t they in the picture, or named at least? Why does he get to plant his shoe on the car and they don’t? Wait a second yourself. He gets to plant his shoe on “his” car because he owns it. I have no doubt that he paid those 5 girls to glue on the stamps that he also likely paid for. Also I suspect him as being the likely candidate for coming up with the idea in the first place. “Artistic achievement” for doing what someone else told them to do? Before we start lamenting why women seem absent, let’s ask what were the names of Michelangelo’s assistants on the Sistine Chapel? Who did the carving and blasting on Mt Rushmore to Borglum’s design? What are the names of the men who riveted together the Statue of Liberty? Oh, why are these men absent from the history of artistic achievement? 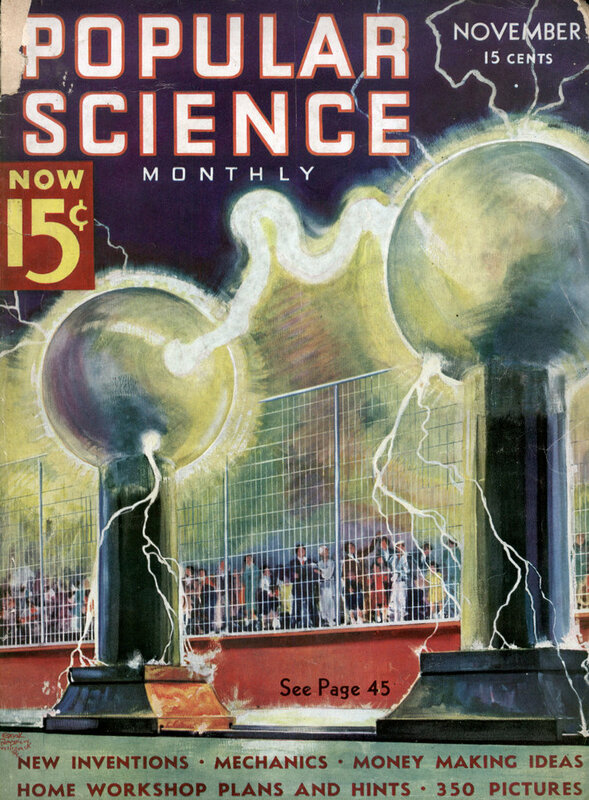 “Wait a second yourself.” It’s a hilarious phrase to read. I’m sure there is some middle ground here. There is nothing wrong with one person feeling that the women mentioned in the piece could have been named, and certainly Michaelangelo’s assistants to the men who put the Statue of Liberty could be recognized in some way – but why get all worked up about it in the first place. This happened in 1936 and the fact that women are absent from the history of artistic achievement isn’t going to change anytime soon – so instead of lamenting the neglected names of workers or arguing to someone lamenting the neglected names of workers, find some way to recognize women in history or look up the names of Michelangelo’s assistants and tell someone else or blog about it. Neither of you are powerless, don’t leave history up to itself, do something. It would make your comments much more interesting. BTW….Bastiano da Sangallo, Giuliano Bugiardini, Agnolo di Donnino and Jacopo del Tedesco – four painters that helped Michelangelo. “Hilarious phrase to read”? Wow. Where were you when I was working stand up? And yeah, why get all worked up in the first place? I agree. I failed to see how people sticking stamps on cars constituted oppression of women or negated the owner’s right to put his foot on his car (but you knew that). Speaking of hilarious,your “don’t leave history up to itself, do something”. It reminds me of “your Mom can make costumes and we can use my Dad’s barn, let’s put on a show!” or “visit a dairy and see where milk comes from”. But seriously now, that’s 4 painters that helped, what about the slobs that mixed the paint and whatnot? Yeah, I know…..hilarious. I would hardly equate sticking stamps on a car to painting frescoes. Would you? By the way, I intend to recruit friends to glue the letters to nylon mesh (akin to the way small ceramic tiles come in sheets) and they will ALL have their names included somewhere on the car. 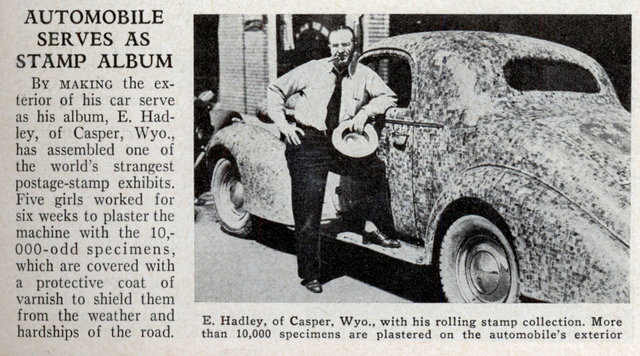 Given the weather in Casper, Wyoming and the quality of varnishes back in the day I doubt if the vehicle or its decoration survived very long. So what happen when it rains? Do you have to let the girls out of the basement to reattach the stamps? Either way, I bet watching them lick all those stamps was fun! If anyone is still out there looking at this. The girls were his daughters and their friends. They did get paid. He drove the car around for a year and then let those same girls tear off the stamps (as much as they could with the varnish on it). He kept the store for many years before he sold it. He lived in Casper until his death in 1977. Its a pity there isnt a colour picture of this car it must have been eye popping! Wow. This is my grandfather. He did this as part of publicity for his Ice Cream shop and Florist Shop. The five “girls” that you speak of are my mother,aunt, grandmother and 2 cousins. But he himself also worked on the car. He used a picture similar to this one as his calling/business card for years. This is also in Rippley believe it or not but I believe there they have his name spelled wrong. The girls were not the only ones to take stamps off the car. All the children in the community were encouraged to remove the stamps with their pocket knives. Yes, in 1936 every child over the age of 4 carried a pocket knife. One child became govener of the state and presented Ed “600” with the three stamps he had removed himself years before. I know this because Ed “600” Hadley was my grandfather. He was a wonderful man and the girls were paid very well to adhear stamps. They were my mother, her sister and three cousins. There are no color photos of the car but I do have one original copy.